I have a quick Magical Monday video for you today – after this one blew up on Instagram (ack!) and then Facebook, lots were asking for a slowed-down version. This isn’t 100% but – it’s better than 15 seconds, right? lol. Watch the video below or click HERE to see it in HD on YouTube. I had picked the little branch from a tree in my neighborhood and came in to paint it quickly – it was “just” a sketch in watercolor pencil that I added some color to, and sometimes “just a” is a good thing for me. If I say “I’m going to do an amazing painting,” I get all choked up! I totally understand why this post is called Magical Monday. 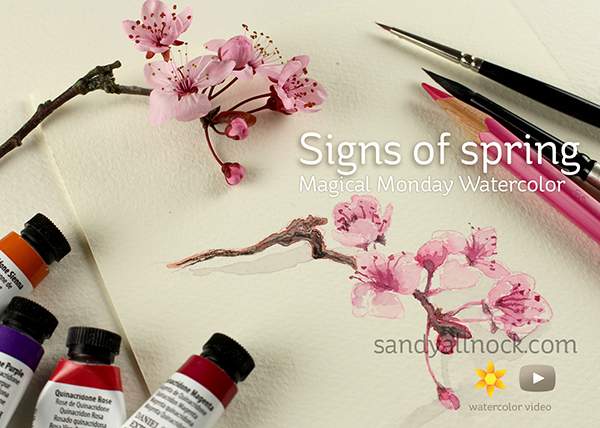 Your water color panel is awesome and love the music to your post as well. Thank you for celebrating cherry blossom season! I love watching you watercolor… It’s very calm and relaxing to watch you..
hhhmmmmm, thank you ever so much! Beautiful bloom twig, and lovely music too! Just gorgeous, Sandy! Wishing you and your loved ones a blessed Easter celebration. How inspiring – STUNNING rendition of the original…thank you so much for sharing your expertise!!!! Beautiful as always. Thank you for sharing. If only…..you make it look so easy and effortless. And as the person before commented calming. Thank you for such a beautiful, calming start to the week. Sandy, this is fabulous–you ROCKED it! Thank you! What a great way to start the morning. What a lovely peaceful moment before my day gets crazy! Thank you. What kind of flower is that? I have seen something similar here (VA) but don’t know the name of it! Lovely (and in my favorite color–pink!). Thanks Sandy for a peaceful way to open my week.